Rumors of insurrection in the highly advanced and isolated country of Wakanda spread around the globe in the month of February. Concerned that the chaos would extend to the fragile, freshly implanted government of Latveria, the country’s legislators worked overtime to secure Latveria’s new freedoms. The citizens of Latveria, no strangers to hostile takeovers, cluelessly went about their normal routines while the Agents of the #FantasyComicLeague doubled their efforts to guard the borders from outside instigators. Despite the challenges facing his own country, the King of Wakanda, Black Panther, traveled to Latveria to help the rival country. 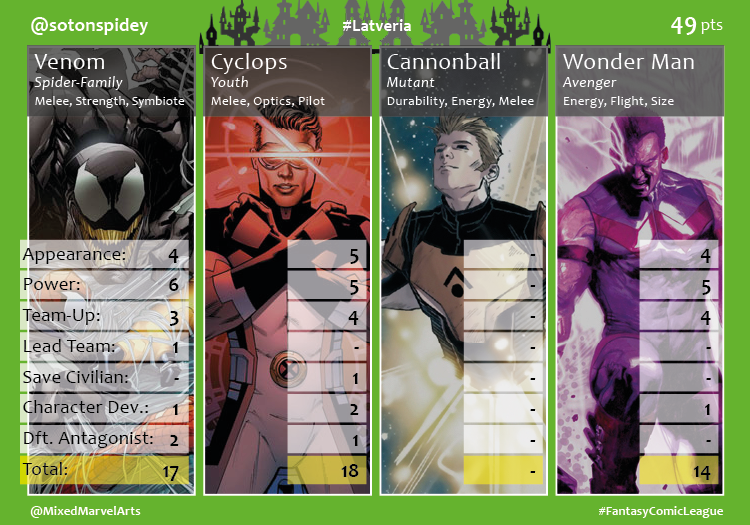 Panther had a stand out month in which he hit for the Fantasy cycle. The recruited heroes saved eight Latverians, up one from the previous month, and defeated 12 antagonists who sought to undermine the new regime. A fairly slow month resulted in the action taking a backseat to the 18 character defining moments experienced by the heroes. 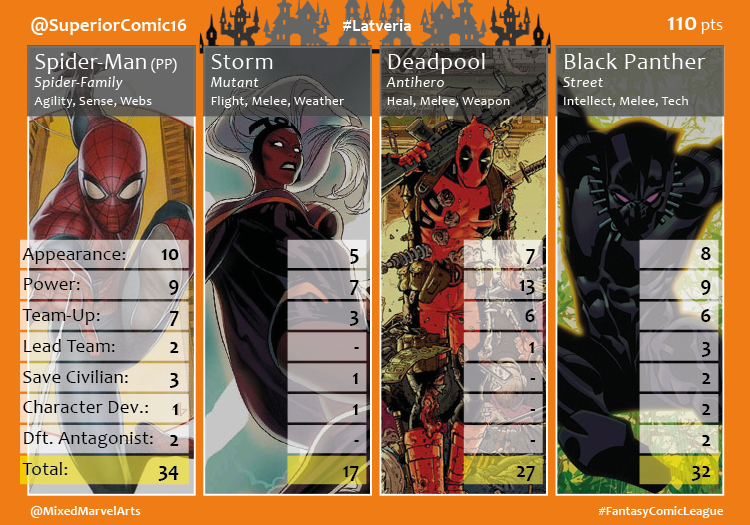 Agent @SuperiorComic16‘s team dominated the division on the backs of T’Challa and Peter Parker, the two highest scoring heroes from the month. Parker joined Panther in hitting for the Fantasy cycle. Superior scored 110 points, which would have been a new record if the high score had not been broken the previous month. 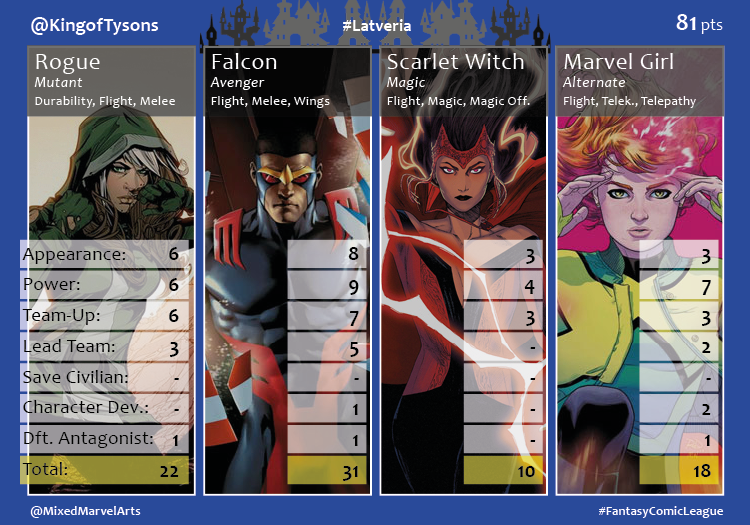 Agent @KingofTysons possessed two of the Avengers leaders, Rogue and Falcon, and took a second place finish. 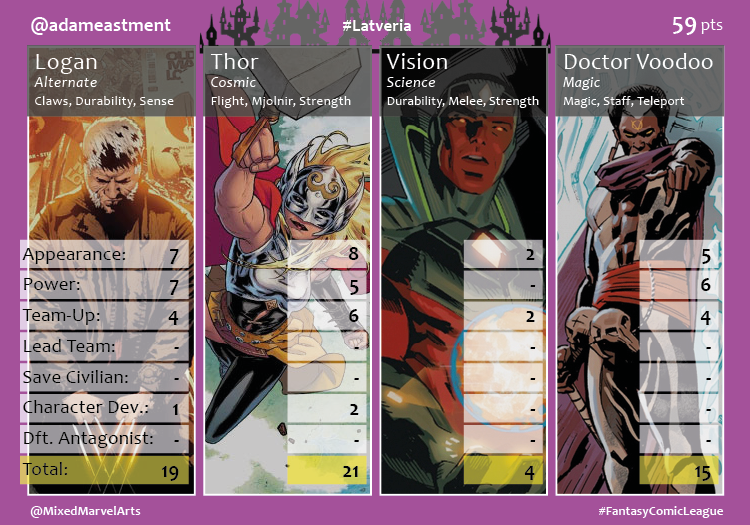 Scarlet Witch was his weak link, only scoring 10 of his 81 points. Agent @adameastment followed in third place. Logan, his star hero, had a slow month by his standards. He scored 19 points, two less than Adam’s top hero Thor. He scored 59 total points. Agent @JamesBSheppard followed in a close fourth-place with 53 points. 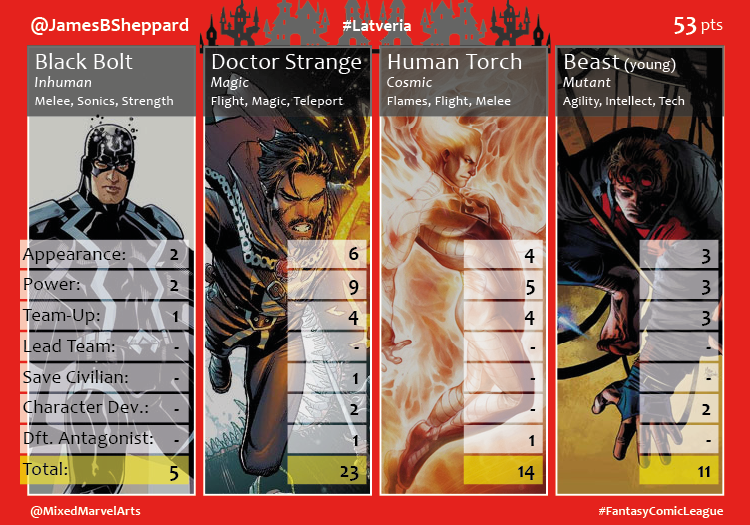 His Doctor Strange had a 23-point performance, but his Black Bolt had another underwhelming performance in the League when he only managed five points. Agent @sotonspidey struggled for the second month in a row. He could have avoided a last place finish if Cannonball made at least one appearance and contributed anything to his overall score of 49 points. The highlight of solon’s team came from the team-up between Venom and the X-Men Blue team. Young Cyclops and Eddie Brock scored him a joint 35 points.